“How are the chickens doing with the goats around?” people have asked us. “Do they mind sharing their space with the goats?” Perhaps the best way to answer is by the numbers: 10/10; 7/7. 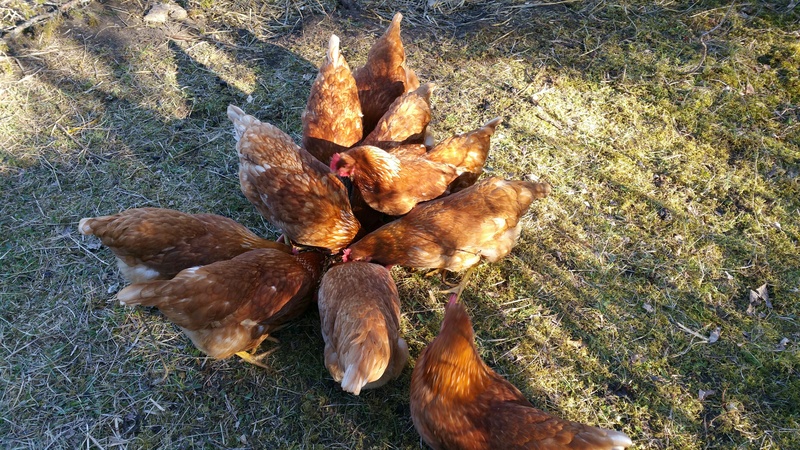 In other words, our 10 girls laid 10 eggs every day of the first week in which we have had the goats. Not a bad record! After that strenuous week they could have been forgiven for being tired and starting to take turns having a day off. Instead, these hard working little girls went all out and produced 11 eggs today! I did some research and learned that it is relatively rare for all of the birds to lay an egg every day over a number of days and very rare for one to lay 2 eggs in one day. So it seems our girls are quite content having goats around. They often graze alongside the goats, something which flocks of birds have done with herds of grazing animals for thousands of years (think herds of wildebeest in Africa or herds of bison in North America). The chickens often spend time grazing among the goats. 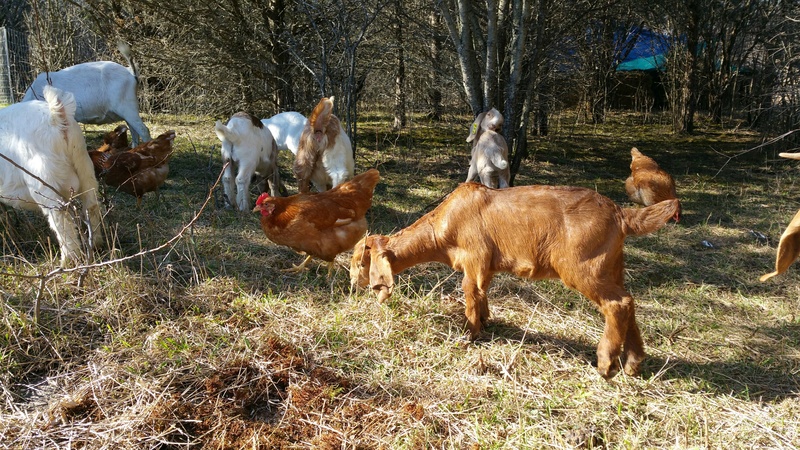 The chickens love eating grass and it is possible that they find insects stirred up by the goats. As noted in Supper time stampede, they enjoy free-loading from the goats’ feed pans or picking up the grain that spills. It is not often the chickens get a pan of goat feed for themselves like this but they usually are hanging around the edges of the feeding goats, picking up what they can. They also spend a lot of time scratching through the goats’ hay and straw bedding and I think that they find seeds and other interesting things in them. All of this is on top of their regular diet of layer pellets, grass, weeds, the occasional scratch (cracked grain), worms and other insects and kitchen scraps. A kind neighbour brings bags of her kitchen scraps for them (but the goats insist that they get their share of kitchen scraps). So, overall, the chickens are doing rather well; and they are rewarding us with all those lovely brown eggs. 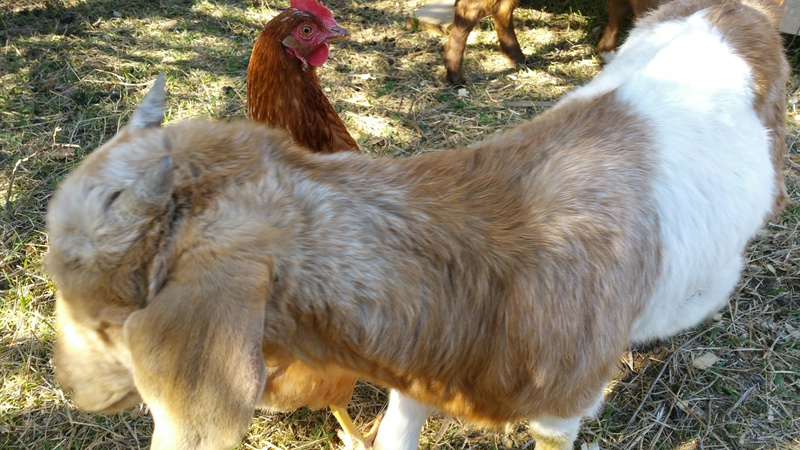 It is rare to find the chickens and goats totally separated.